Joel Highsmith built a Dodge Challenger with the goal of breaking the 200 mph barrier at events like the Mojave Mile. Now that dream is shattered because the car has been stolen. Let's see if we can find it. According to Allpar and multiple concerned people who have emailed us about the case, the Challenger was taken around 7 p.m. Sunday in the parking lot of Spankin Time Motorsports in San Bernadino, California, which is located at 160 South D Street. The car was in a 39-foot black and red enclosed trailer, pictured here as well, which was believed to have been towed off by a white Ford F-350. 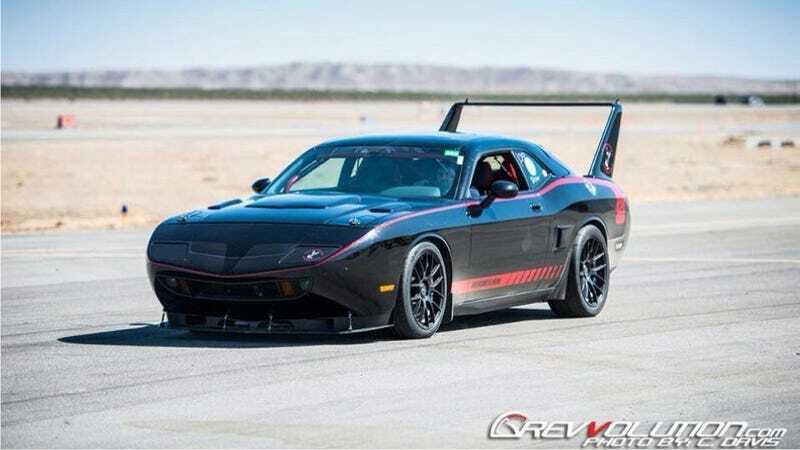 The Challenger, built by Spankin Time Performance, is said to be worth about $200,000 and rated at about 1,005 horsepower. Anyone with info about the car is asked to call (909) 388-2536 or email info@spankintime.com, although you should probably call 911 first. This should be an easy one, folks. How many red and black Charger Daytona/Plymouth Superbird-looking new Challengers are out there running around? If you see one like this, that's probably it, you know? Let's hope it gets back home where it belongs.